Bee sting therapy is a type of “apitherapy,” a term which refers to the use of bee products to treat medical conditions. Other forms of apitherapy include the use of bee pollen, propolis (a waxy substance produced by honey bees), raw honey and royal jelly. Bee sting therapy, also referred to as “bee venom therapy,” is pretty much just what it sounds like i.e getting stung with bees in a controlled setting. It is used by people with many different autoimmune disorders, including MS, rheumatoid arthritis, lupus and scleroderma. It is also used for a number of other diseases and conditions, including depression, skin conditions, menstrual cramps and varicose veins. It is claimed that bee sting therapy works with the patient's own body to reduce inflammation. The theory is that because the stings produce inflammation, the body mounts an anti-inflammatory response. Presumably, this would then work to reduce inflammation where the myelin is being attacked by the immune system in a person with MS.
Bee sting practicioners include nurses, acupuncturists, naturopaths and interested laypersons, including beekeepers. Some patients eventually just order some bees and perform the sessions themselves. Bee sting therapy is also given by physicians, who use venom in an injectible form and inject it under the skin, rather than live bees. Before the treatment begins, the therapist may inject the patient with a weak form of the venom to test for an allergic reaction. A bee (usually a honeybee) is held with tweezers up to a part of the body. The stingers are left in for up to 15 minutes, then removed with tweezers. Between 20 to 40 stings are done each session, and a patient typically gets three sessions a week. How Effective Is It for MS? Bee sting therapy has been studied on a limited basis for MS. A couple of studies used bee sting therapy in mice who had experimental allergic encephalomyelitis (EAE). 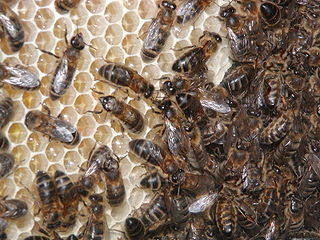 The treatment not only showed no benefit, some of the mice receiving bee stings seemed to have a worsening of symptoms. A 2004 randomized crossover study was conducted in the Netherlands among 24 people with either relapsing-remitting MS or secondary-progressive MS. While the treatment was well-tolerated, no beneficial effects were seen on the MRIs or clinically among these patients. Despite a lack of scientific evidence, bee sting therapy has been reported by people with MS to increase stability, as well as reduce fatigue and spasticity. More than 1,300 people with MS have sent testimonials to the American Apitherapy Society in support of the therapy. Most people experience some degree of swelling and redness at the sting site. About 20% of people experience itching, hives, fatigue or anxiety. Some patients report flu-like symptoms. Death: A small number of people (less than 100) die every year from reactions to bee stings. These deaths could be due to anaphylaxis (severe allergic reactions) or heart attacks brought on by a mild allergic reaction in combination with other factors. It is important that an Epi-Pen Autoinjector be available in case of an allergic reaction.. Optic Neuritis: This inflammation of the optic nerve has been caused in people, even without MS, when bee stings are given on or near the eye area, including the temple or eyebrow area. It is important to avoid all bee stings in this area. Acute Disseminated Encephalomyelitis: This is a rare form of inflammation of the central nervous system, which is very similar to that which occurs in MS. Cautions: Bee sting therapy should not be used by people with insulin-dependent diabetes, syphilis, gonorrhea, tuberculosis or severe allergies. Nonetheless, bee venom therapy has generated enough "buzz" that Georgetown University in Washington, D.C., has begun a one-year preliminary study, funded by the Multiple Sclerosis Association of America, to research apitherapy as a potential treatment. In the end, researchers hope to settle the debate whether bee venom should be considered a serious treatment for MS.